Yes, it’s me, I’m back. I have garlic and I’m not afraid to use it! In my house, garlic is a food group, along with chocolate and red wine. Sounds like a party, no? 🙂 Last summer I had a bumper crop of basil. I love me some fresh basil, also a food group. Because I didn’t want to waste any, I ran it thru my food processor with a little olive oil and put it in ice cube trays & froze it to use later. Since pesto is just basil that’s been put through a food processor with olive oil, garlic, pine nuts & parmesan, I figured I’d have the hard part already done, right? Great. So, now I’m coming up with new ways to use my bounty. And just in case you’re curious, yes, I will have basil in my garden again this year. Today I was trying to decide what dinner would be and I saw the premade pizza shells at the grocery. 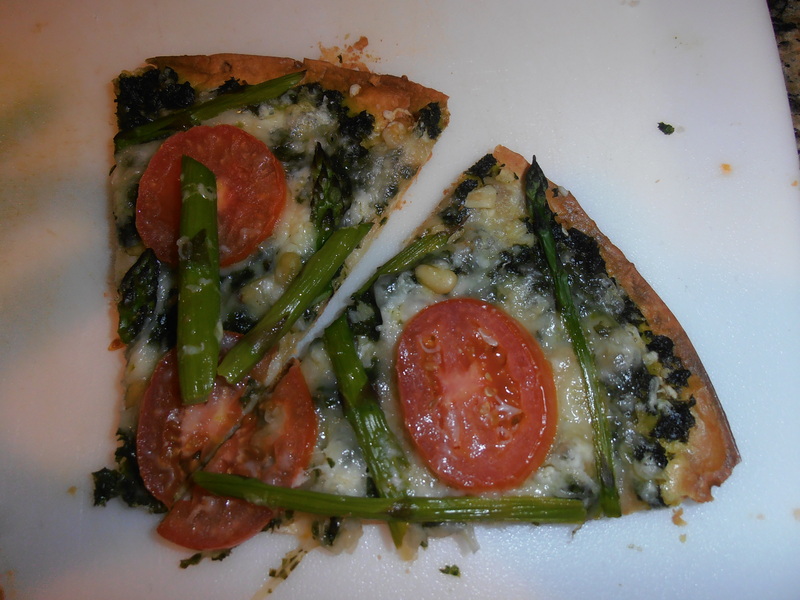 I love the thin & crispy crust pizza and was thrilled to see a pre-made thin crust. Pizza Margherita is wonderful and I rarely see it when I go out. Hmmm, thin crust pizza shell, tomatoes in the fridge and basil ready to go? I’m in! But….here I go again, changing things up. You’ll be so proud, I took pictures! In case you don’t know what Margherita pizza is, it’s a pizza crust with olive oil, minced garlic, mozzarella, sliced tomatoes and basil. Yum! It’s a very light & flavorful pizza. Mine, well, mine was essentially pesto pizza with tomatoes. In my fridge, I happen to have some gorgeous fresh asparagus that I picked on Friday at Thunderbird Berry Farm (I so wish they had a website). And a jar of pine nuts in the cabinet calling my name too. Yep, I did it. I added them to my Margherita pizza and, well, all I can say is WOW. amazing! So, if you love caprese salad, you’ll love Margherita pizza! Give it a try! You won’t be sorry! 3. spread chopped basil over olive oil, sprinkle garlic & pine nuts over basil. ****NOTE-if you don’t want your tongue to slap your brains out, feel free to decrease the amount of garlic and/or basil. If you use fresh basil, the taste will be delicious, but not quite as powerful as my version. Allium Sativum, How I love Thee…. Y’all already know of my passionate affair with Allium Sativum, that’s the scientific name for garlic. It’s a wonderful thing that I’ve brought my husband along to enjoy. Well, I kinda have to, you know, how gross is it when your date/friend/spouse/partner has just consumed what smells like an entire head of garlic and starts talking/laughing/singing to you? Blech. Sick. My thought is if I have company in what I’m eating, we’re both pungent and no one cares! Make sense? Well, it does to me! Almost like drinking alone, it’s just not the same. Hmm, I don’t know that I can say that either, I don’t mind having a glass of wine by myself. Preferably in a hot bath with a good book. Back to my garlic. I really should try to grow my own, since I eat it like an apple. Ha ha! Just kidding, I seriously do NOT eat garlic like an apple. Have you ever sampled a raw fresh garlic clove? It’s spicy, like raw onion spicy. It’s been a while since I shared about garlic, and since I’ve got some new friends, how about a little refresher? Garlic is fantastic in many ways, besides chasing off those pesky vampires! It’s really good for your heart and circulatory system, your immune system, and even though they say it doesn’t act as a mosquito repellent, I totally think it does b/c when I eat a lot of it, they don’t come near me! How about I just break it down into bullet points? Fresh will always be best over jarred. When it’s processed, it starts to lose it’s potency and flavor. Besides, storing/peeling/using fresh garlic couldn’t be easier, really. Start off by choosing a head (that’s the whole thing) that’s white in color and the cloves (the little pieces that you break off to use) are nice and held tightly together (remember “White and tight”). The ‘head’ of garlic breaks into ‘cloves’. I remember reading about someone who was a newlywed and trying a new recipe, ’20 garlic clove spaghetti’ and mistakenly thought the whole head was a single clove! She put 20 WHOLE HEADS of garlic in her pasta sauce! And being a sweet husband, he ate it and didn’t complain, although she didn’t make it again! Store garlic in a dark cool space, I keep my in my pantry. Do not put it in the fridge, it will lose it’s flavor, besides, it’s not necessary to store there. To peel a clove of garlic, break off the clove from the head. Place the clove on a cutting board/hard surface and lay knife flat over the clove with the blade pointing away from you, use the heel of your hand and hit the flat part of the knife blade to kind of crush the clove. Then you can easily peel the clove and do what you wish with it. another method to peel multiple cloves, I saw on YouTube, break the head apart into individual cloves, and with two bowls of the same size, place the garlic in one bowl and put the other bowl on top going the opposite direction (top to top), hold it together and shake back and forth vigorously. I’ve tried it and been sort of successful. If you really want to release more of the garlicky goodness, use a garlic press. They are fantastic little gadgets and you don’t even have to peel the garlic before squeezing it where you want it! I got mine from The Pampered Chef ages ago. It’s super easy to use. I love it when I really want a strong taste, by squeezing it, you release more of the oils, hence flavor. If you want the flavor of garlic, but not an overpowering level, you can mince it on your cutting board. If you’re afraid of garlic, or don’t really care for the stronger taste, try it roasted. Roasting the head of garlic will make it soft, a tiny bit sweet, and spreadable. One of our favorite restaurants serves roasted head of garlic with crusty fresh-baked bread. MMMM who needs an entrée when I have that? Are you hungry yet? I’m thinking garlic chicken stir fry or some fresh bruschetta. Or maybe some roasted garlic smeared on crusty bread. And a side of mouthwash! So you remember my post about all the ways I love garlic? Here’s a quick, easy and healthy way to get it into your diet! 1. in a wok, heat oil to med/high and stiry fry the vegetables 3 to 5 minutes, or until tender. remove from pan. 2. put chicken in pan and cook until no longer pink, approximately 5 to 8 minutes. 3. mix chicken broth, water and soy sauce. 4. push chicken to the side of the wok, pour liquid mixture into center of wok. stir and cook until bubbly and slightly thickened. 5. add vegetables, including water chestnuts, back to wok. stir and cook until completely heated through and blended. Delish and nutrish! It goes together really easily and is healthy. And the best part, it’s even better the next day! enjoy! Sorry, once again, no pics, we were starving and dove right in! I love this dish! My children even love it, which makes me like it that much more! And once again, it’s a meal in a pan, but hey, who can complain about that? Less dishes to clean, right? I must apologize, I didn’t get any pics, we were starving and ate it before I could get my camera out! 1. brown ground beef with garlic. drain. 2.cook pasta according to pkg directions in salted water. drain. 3. put tomatoes, tomato sauce, beef broth, Worcestershire in with beef. 4. Bring to a boil. Reduce heat and simmer uncovered until sauce begins to thicken. 5. Add spinach and stir until spinach is wilted. 6. Toss beef/tomato mixture with pasta. Sprinkle cheese on top and cover until cheese is melted. There you go, can’t get much easier than that! If you like your spinach pieces larger, you can just do a coarse chop, or even leave the pieces whole. We discovered last time that my son likes the spinach to be in tiny pieces. Ok with me! If that will help him eat it better, I’m all for it! Let me know what you think, it’s Italian-esque, without being typical Italian. Another slow cooker recipe: French Onion Soup! Mai oui! Love me some French onion soup on a cold day, so imagine my delight when I came across this recipe (which I immediately modified)! I will share it with you as it mostly was originally and tell you next time I will not add quite so many onions, I’ll use half as many as it called for, it was very oniony, good, but oniony. 1. Saute onions in butter until onions are crisp tender. 2. Put all ingredients except french bread and cheese in 4 qt slow cooker. Cook for 5 to 7 hrs or until onions are tender. 3. Remove bay leaves and ladle into bowls and top with toasted French bread and a sprinkle of cheese. This is one of those recipes that makes a big batch and could easily be halved. It’s so delicious on a cold night without being too heavy. Enjoy! As per my norm, I saw this recipe and immediately altered it! You know me, I can’t seem to leave anything alone! This is really delicious, extremely simple and very healthy. It’s loaded with protein, fiber and, wait for it….TASTE! I promise, you will so love it! Cook orzo according to package directions. Drain. 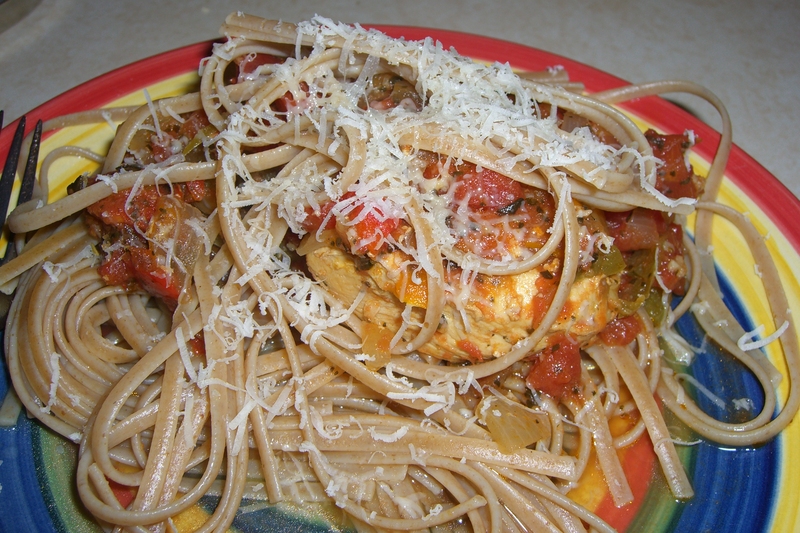 While orzo is cooking, in a large skillet, cook chicken in olive oil 5 to 6 min, or until no longer pink. Remove from pan and keep warm. Add garlic to remaining oil and cook about 1 minute. Put tomatoes, beans and italian seasoning into skillet and bring to a boil. Add in broccoli and chicken, reduce heat stir to blend and allow all ingredients to com to the same temperature. Put orzo in the chicken mixture and stir to blend. Serve with a nice green salad and you are done, done, so done! Calorie info: 1-1/2 C =approx 350 calories. You can’t beat that! Enjoy and do tell me if you give this a try! So sorry I have no pics to share, we dove in so fast, I didn’t have a chance to grab my camera! By now, if you’ve been hanging out with me on a regular basis, you know I love me some Italian food. I think in a former life I really must have been Italian. I love the food, the wine, the language sounds incredible (although I know not a single word besides names of pasta), the scenery. A trip to Italy is at the top of my bucket list. So, it really shouldn’t surprise anyone that when I found this recipe, I ran around in little circles like a yippy dog (minus the tinkle on the floor!). It’s delicious, and even better, EASY! Are you ready??? I know, right? Makes me hungry right now! 5. bring to a boil. reduce heat and simmer uncovered 20 to 25 minutes or until chicken juices run clear and sauce is slightly thickened. Serve over pasta and sprinkle with parmesan. See what I mean? EASY! If the red and yellow peppers are way expensive (like most of the time around here) it works well with green peppers as well, they just give a different flavor. This is how I like it! 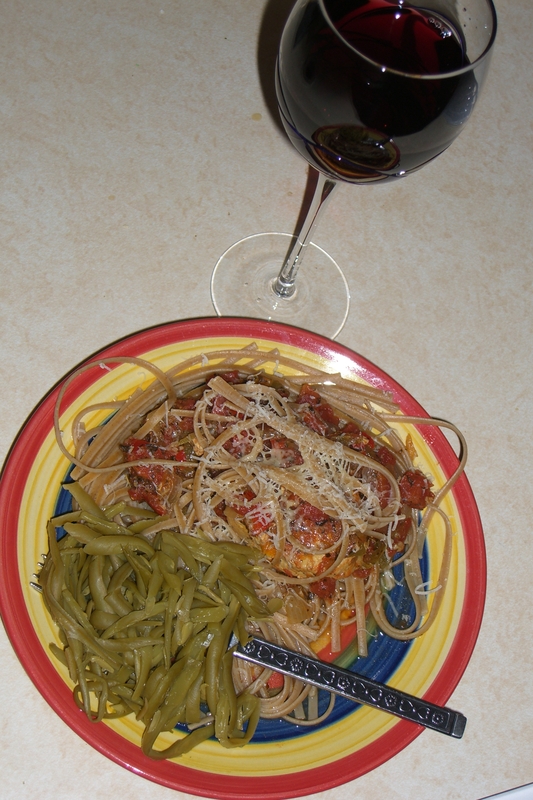 A green veggie on the side and nice glass of zin to go with! Mangia! If you’ve been along for my ride into domestic goddessness, you’re familiar with my love of garlic. If you’re new to my world, garlic is a food group in my house!. This recipe totally takes into an all new direction! Basically, it is a chicken version of my thought ‘too much garlic is just right’! If you love roasted garlic and an easy recipe, this one is definitely for you! Just be sure you’re not eating it alone b/c you won’t be getting any lip action if the only one indulging is you! I just thought of something, if you’re like my sister-in-law, who doesn’t like really powerful garlic flavor, but you do like the roasted garlic, this is a good recipe. Cooking the chicken in the same pan as the garlic, you get a bit of the garlic flavor, but it’s not like you’re eating raw garlic. The chicken is very juicy and flavorful. mix the seasonings, salt and pepper and sprinkle on top of the chicken, and don’t be shy with it! Push the garlic to the sides of the skillet and put in the chicken seasoned side up. As chicken is cooking, prepare the rice according to package instructions. Carefully turn the chicken after about 5 to 6 minutes and continue cooking on the other side on med/low heat, until chicken is done and juices are clear. If the garlic looks like it’s getting overdone, take it out and put it in a bowl for later. Serve the chicken over the rice and you can either squeeze the garlic over the chicken, or just put the cloves in a bowl (like we do) and eat it with the chicken. The garlic comes right out of the shell, it’s soft and nutty like roasted garlic. My 7 yo daughter can’t get enough of the garlic! I have also served this with Rachael Ray’s Garlic and Parmesan Orzo for a super duper dose of garlic! when I did, my friends down the street could smell it! You can’t get much easier than that! Enjoy and let me know how you like it!